Valeric acid is an organic chemical compound with the chemical formula C5H10O2. The primal use of this acid is in the syntesis of ester. Those volatil ester tend to have pleasant odors and are used in perfumes and cosmetics. Some of these esters are used as food additives because of their fruity flavors. 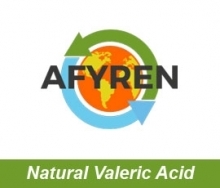 AFYREN produce a 100% biobased Natural Valeric Acid with a respectful process for environment and non GMO natural microorganisms. The raw materiels used are also non GMO.